Three Square Market will be the first firm in the U.S. to install microchips in its employees’ hands. The company is anticipating that over 50 employees will be voluntarily chipped out of 85 employees at the company’s head office, according to Tony Danna, vice-president of international development. The program is slated to begin August 1. 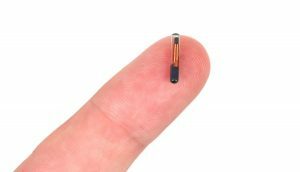 The small implants use near-field communication technology, or NFC, the same as in contactless credit cards or mobile payments. When activated by a nearby reader, a small amount of data flows between the two devices via electromagnetic waves. Installing and removing the chip isn’t difficult. The chip is inserted with a needle between the thumb and forefinger. Danna said putting it in is “like getting a shot” using a syringe, and taking it out it like removing a splinter. The program will be a real-life opportunity for the company to test and expand the technology for its own products. The company provides technology for break-room markets or mini-market kiosks. The device eliminates the inconvenience of a forgotten employee badge or credit card. Once an employee has the chip installed, he or she can purchase food in the break room, open doors and log into computers. The company see the devices as one day being simply another payment and identification method. Westby also said, “Eventually, this technology will become standardized allowing you to use this as your passport, public transit, all purchasing opportunities, etc.” Three Square Market’s partner, BioHax International in Sweden, has already started using the microchips in about 150 of its employees. The company began implanting workers in January 2015. A company based in Belgium also offers its employees such implants.